It's about time it went under the knife. We've trashed the looks of the current Nissan Versa sedan here and here, and probably a few more places we can't remember. 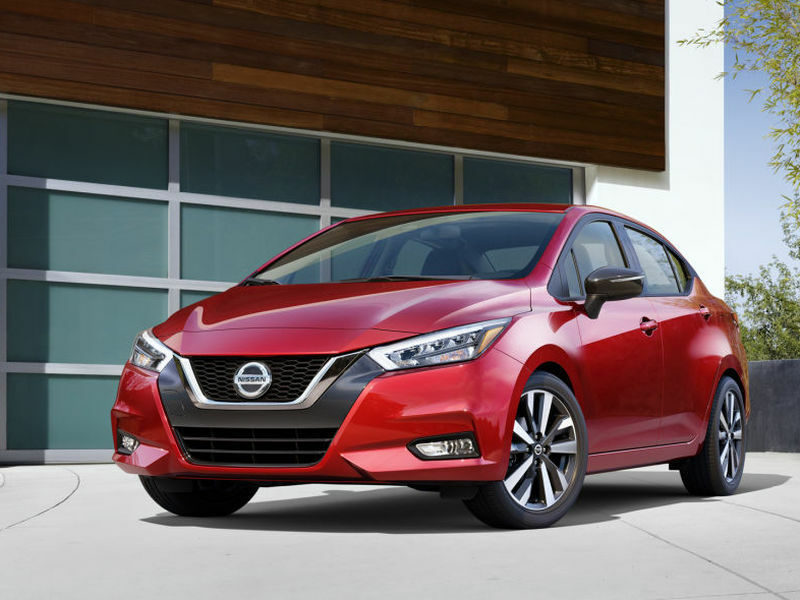 But it appears we won't be able to do that much longer since Nissan just unveiled its success, which thankfully no longer looks like a wildebeest's afterbirth on wheels.The 2020 Nissan Versa actually looks quite good, mimicking the handsome styling of the new Altima. Even though the Versa sedan touted its "America's least expensive car" reputation, the new Versa doesn't look like the "cheapest" any more thanks to the updated signature V-Motion grille, edgier styling all around and proportions that finally look right. And we will SO not miss the headlights on the old car that oddly looked like a giant ballerina's foot. Seriously, what WTF was that? The new Versa's sharp taillights and sleek floating roof also copy the Altima's, and it helps the little car pull off some sportiness in its look. Goodbye dumpy, hello sleek. The new car looks nothing like the old one. Though the affordable sedan looks sporty (especially in the SR trim shown in these photos), it won't be a rubber-roaster. Though the 1.6-liter four-banger gets 13 more horses and 7 more lb-ft of torque (122 and 114, respectively), it's still not as much as the 130 found in the Kia Rio or the 132-140 in the new Toyota Corolla. BUT you can get a manual transmission standard, but you can also upgrade to an awful CVT if that tickles your fancy. If you own the old one, please avoid stopping next to the new one at a traffic light. The new Versa will get some nice safety features such as automatic emergency braking with pedestrian detection, lane departure warning, auto high beam assist and rear automatic braking. That's a lot of standard equipment for very little money. You can also upgrade to features like blind-spot warning, rear cross traffic alert, and adaptive cruise control. It's the way of the world these days with brands like Toyota leading the charge with great suites of standard safety tech. With a sleeker roofline and a less bulbous front end, the new Versa has better proportions. Inside the Versa is also a much-improved cabin that no longer looks like a rental car from an independent company in a small town that's been forgotten. Yep, we hated it that much. Though we don't expect high-grade materials at this price point, the new interior looks more open with cleaner surfaces, a lower dashboard, and even a flat-bottom steering wheel (likely just for the SR). There are also new gauges, circular outboard HVAC vents, and even Apple CarPlay and Android Auto available as options for the new infotainment screen. And boy we hope those seats are new. Those last ones felt like they were molded by hand, a toddler's hands. This shot of the SR's premium cabin brings the Versa into the modern age. Nissan will sell the new 2020 Versa this summer, but no pricing has been made available. We're guessing it will be a tad more than the current (and almost shocking) price of $12,360 base MRSP. Nissan will likely want to keep the title of "America's least expensive new car", so don't expect any big price climb. We're just glad it'll no longer be totally embarrassing to drive one.